'Tis the season for sweet, buttery, spiced baked goods. 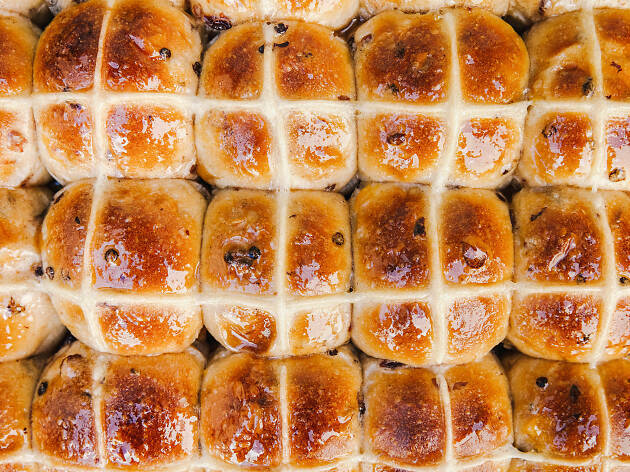 Here's your guide to the best of the buns. After coffee with your bun? 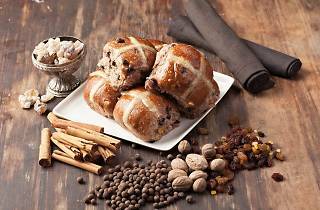 Check out cafés open on the Easter long weekend. Want more sweets? 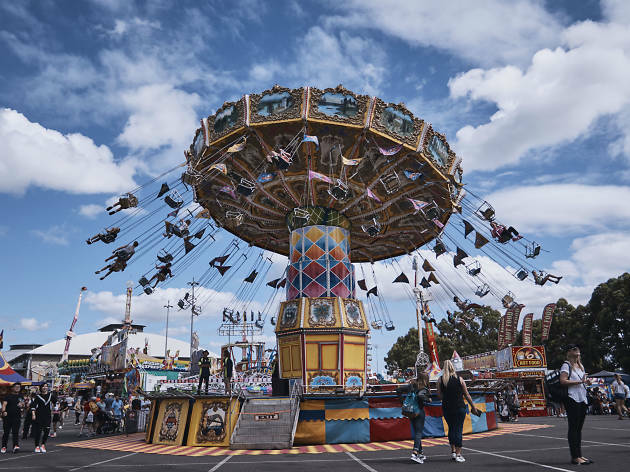 Check out Sydney's best desserts. 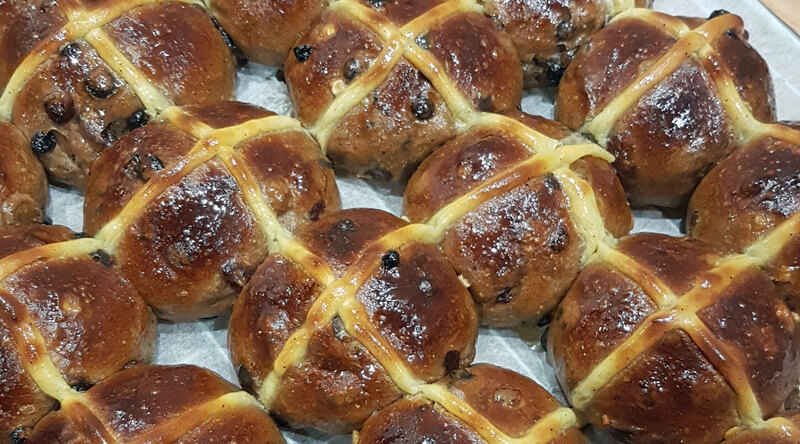 In addition to filling the hot cross buns at Black Star with fat juicy sultanas, raisins, spices and fragrant chunks of orange peel, the team have added a special touch – a Frankincense glaze. 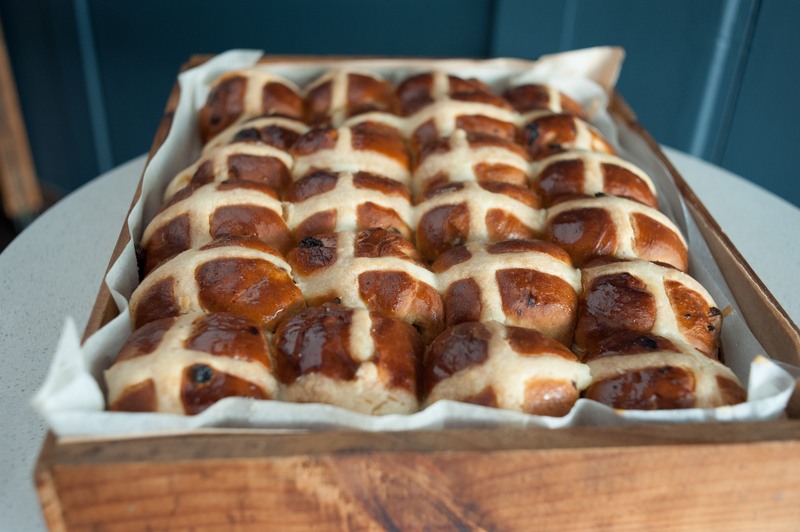 The infused sugar syrup gives the buns a sticky, glossy coat and the runoff that soaks into the dough adds an extra perfumed kick. Plus, did you know that they are vegan? 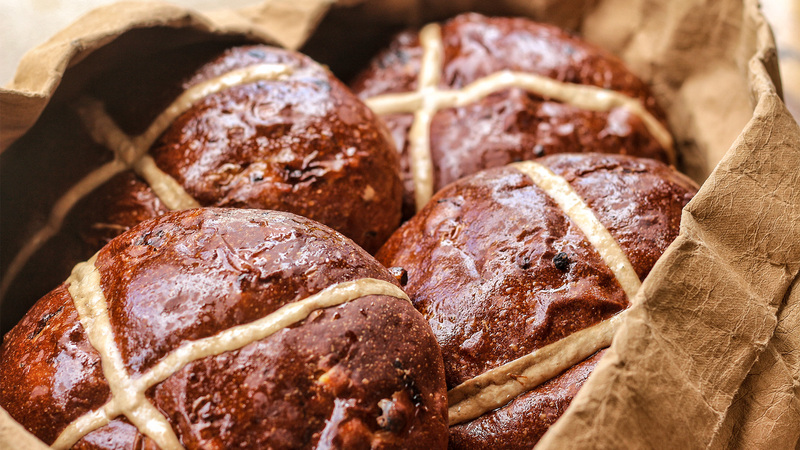 Dried fruit can be divisive, but if you're the sort of person who likes a few choice sultanas, but not a free-for-all in your hot cross buns then you'll want to lock down a six pack from Bake Bar. 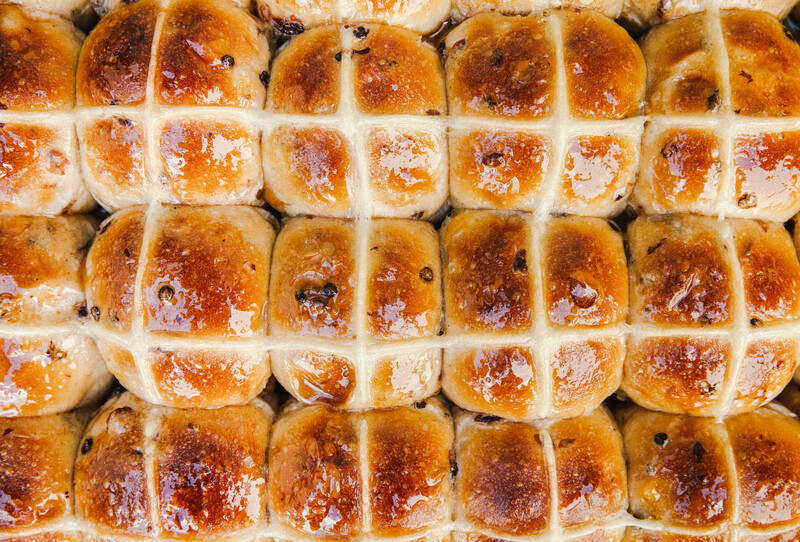 These are a people pleasing bun. Soft, white, and fluffy; low on spice and fruit; and they develop a lovely crisp shell when you chuck them in the toaster. Also, in a very inclusive move, Bake Bar also sell a gluten-free bun made from tapioca, sorghum and beasib flours. 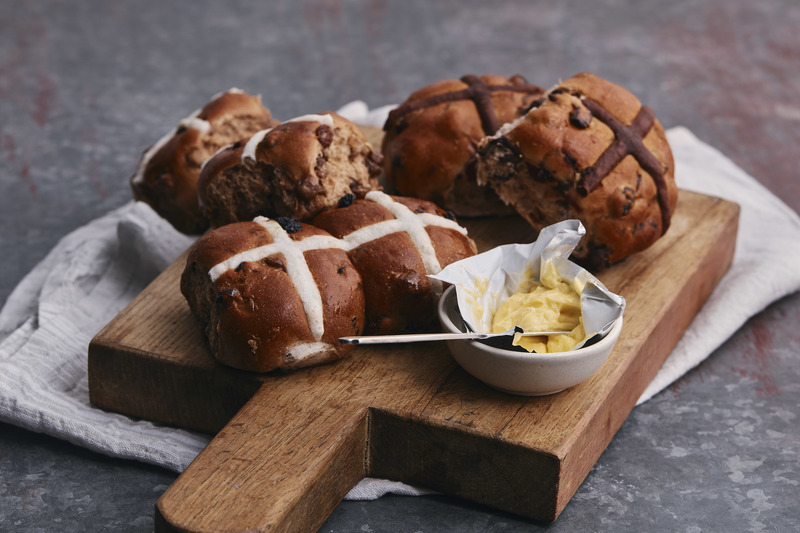 At Sonoma outlets across Sydney their Easter offering is all about French curves rather than right angles – their 'not cross buns' are marked with an ‘S’ instead of an ‘X’ (you say Sonoma, we say secular, we can all be right). 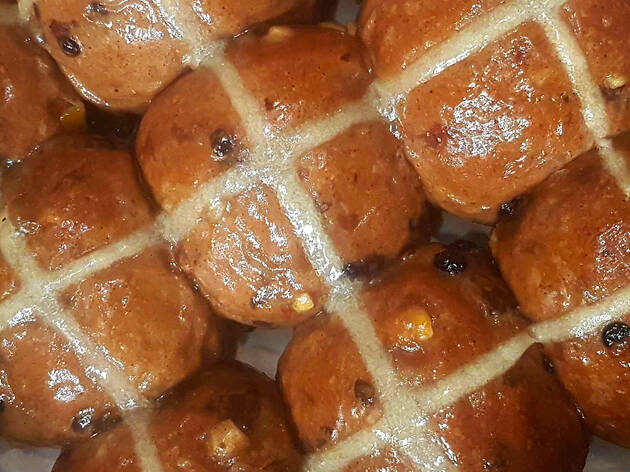 These sweet little buns are light and airy and only use a very limited amount of peel in their dried fruit mix. They also add cranberries for a little extra sweet kick and opt for smaller raisins for more even fruti distribution throughout the spiced bread. 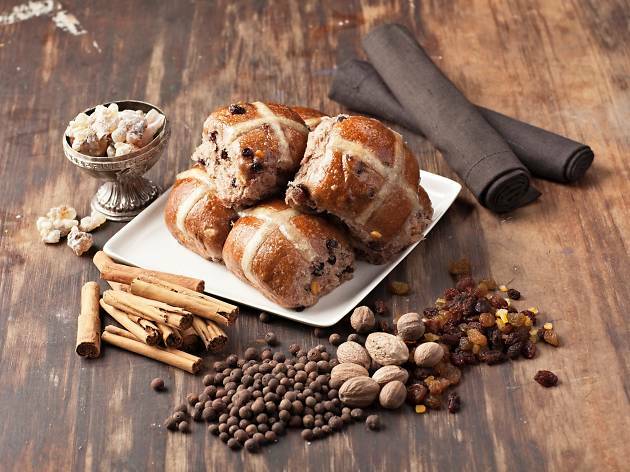 The Easter bun at Textbook is made with a mix of peel, currants, sultanas, and cranberries, with a mix of ginger, cardamom, cinnamon, nutmeg and wattleseed for that extra warm and spicy kick. 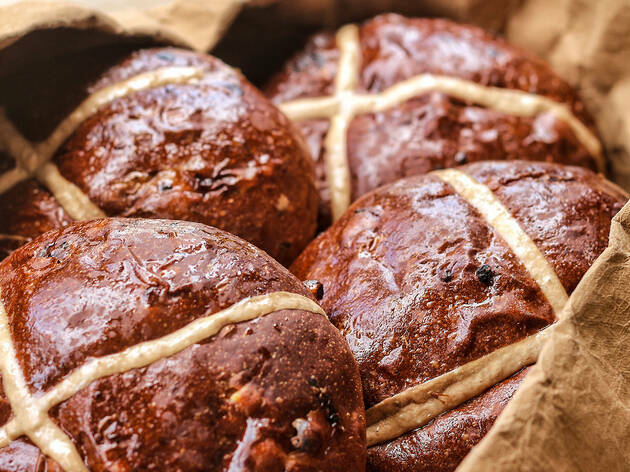 But what really gives these buns an edge is the glaze, which they spike with yuzu, that sharp moreish citrus flavour that creates a high note to contrast with all the earthy flavour in a classic bun. 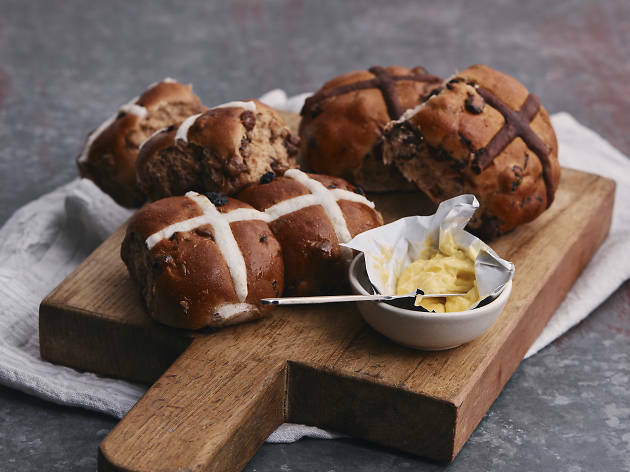 The upmarket department store is making their own hot cross buns and it's a solid contender for our affections. 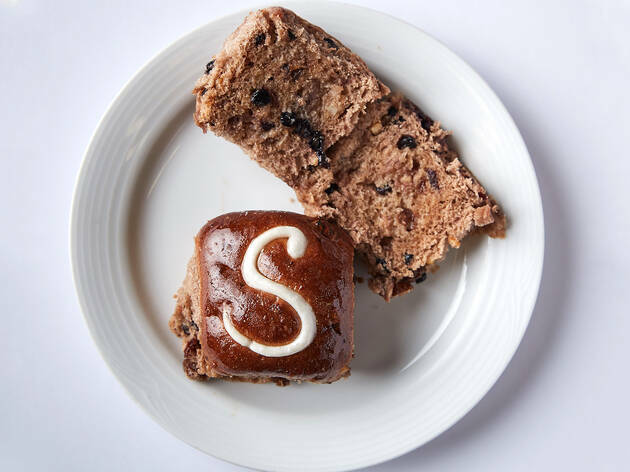 A pack of six will set you back $11.95, and for your trouble you'll take home six sticky, fruit-heavy buns that have a gratifying weightiness to them – this is not just a bap with raisins. They're best toasted, and there's no discernible peel content for citrus naysayers. These are not the kind of buns that leave you surfing a high GI wave after eating them. 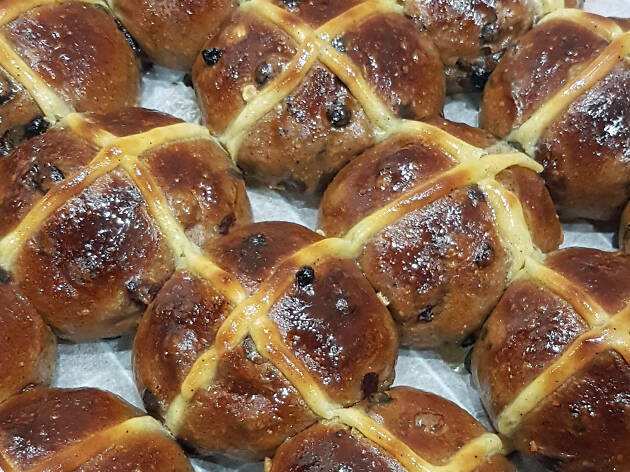 There's a rustic Quality to Nadine Ingram's baking across the board at Flour and Stone, and it extends to her hot cross buns, which are still sweet and spicy without going into full cake territory. These ones aren't intensely fruity, and they keep the raisins and peel small too. 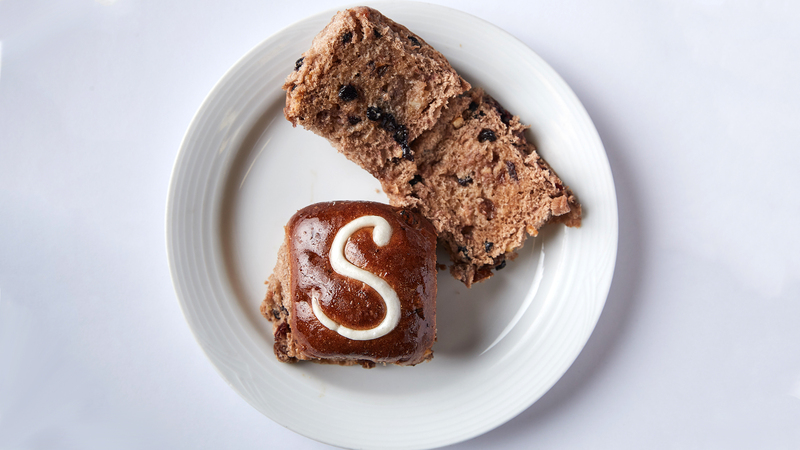 A very nice touch is that they'll send you home with a little pat of butter for your bun if you're eating on the run. Do you like raisin toast? Of course you do. And what’s better than fruit toast? 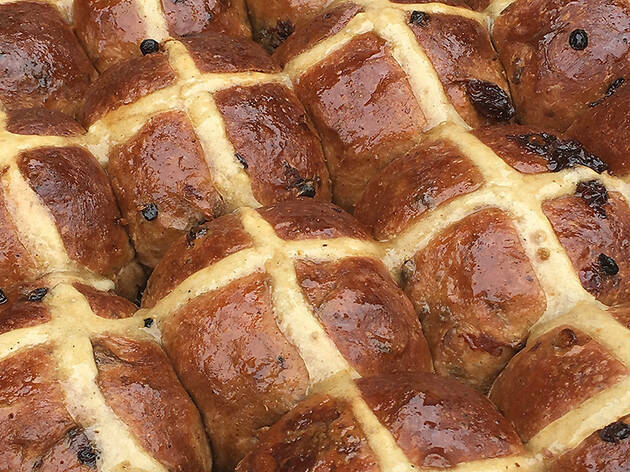 Hot cross buns. The limited season of these sweet treats make them extra special, and Bourke Street's iteration is lighter and fluffier, having more in common with a fruti bread than a sweet pastry. Big juicy sultanas and scant orange peel complete the effect, plus they'll toast and butter them for you on site if you want a hand held snack in a hurry. 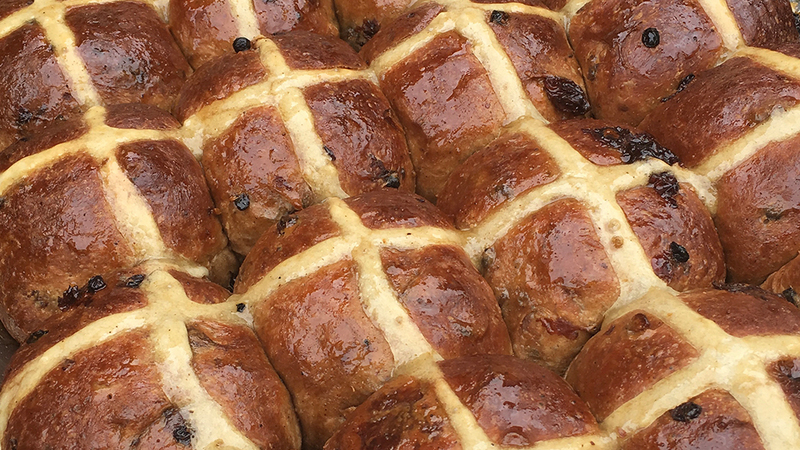 It's a very tight run if you want hot cross buns from pastry meastro Andy Bowdy. 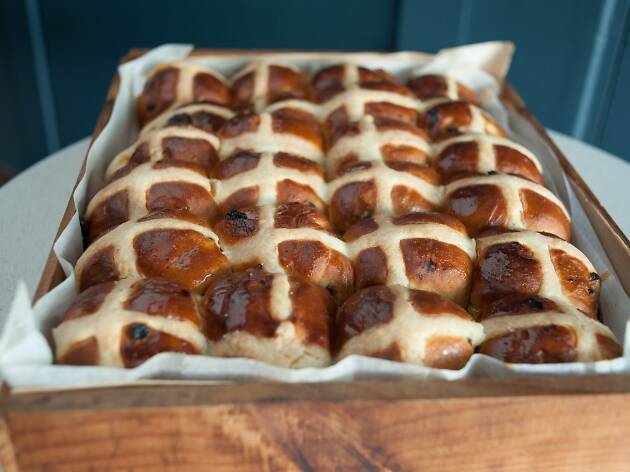 Saga will start baking their buns on Wednesday Apr 17 for one week, but they're staying open Good Friday to Easter Sunday so you can road test his spiced brioche spiked with brandy and bourbon-soaked fruit and peel.